What makes Costa Rican quality of life unique? There is a place in Costa Rica where the exuberance of natural wildlife and visitors become one and where the water is a giant mirror reflecting the lush foliage all around. Surrounded by a system of natural canals and lagoons running from southeast to northeast, Tortuguero National Park, located in the Northern Caribbean side, is without any doubt our little Amazonas. It is also one of the most important places in the world for the protection of the green turtle and home of other species such as the manatee, the American crocodile and the Gaspar fish, which is considered a living fossil. Majestic birds such as the Great Blue Heron, the biggest heron in the country, and the Northern Jacana, famous in the animal world because the female protects the territory while the male nests the eggs, populate and thrive in this rich environment. The birds are so diverse that they account for approximately half of the species found in Costa Rica and surpass the number of species found in all Europe. Herbal swamps, marshlands and ‘flooded’ forests are part of this array of diverse habitats. But Tortuguero is not only about nature. Being on the Caribbean side, it is one of the larger regions of Afro-Caribbean culture in the country. The majority of its population has Jamaican origins and keeps their food, dances and traditions. Their dishes are mostly spicy and many include coconut, giving Tortuguero a well-founded reputation to experience nature and culture. 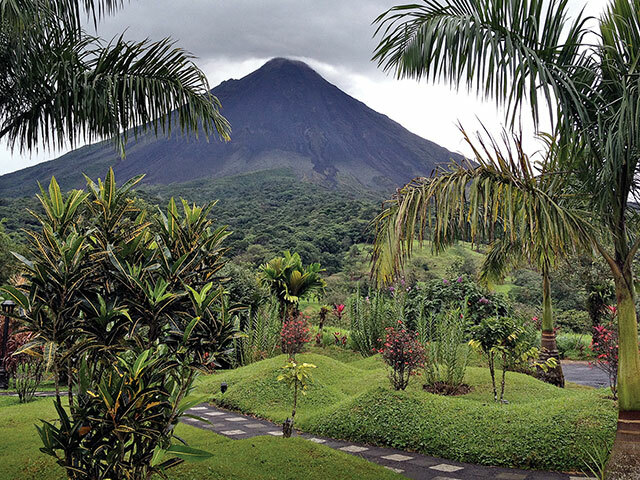 One of the most popular is the Arenal Volcano, which last erupted in 1968. Until then, it was assumed that the volcano was just another peak of the mountain range. The mountain and surrounding area were declared a national park in 1994. Thermal hot springs are now the area’s main attraction, most of which boast nearby trails and numerous lookout points. Currently, Arenal Volcano only releases gases in crater C and has fumarole activity in crater D. Seismic monitoring of the volcano indicates that volcanic activity remains low and external manifestations have been reduced to a minimum. In 2010, after 42 years of uninterrupted volcanic activity, the volcano entered a resting phase, ceasing explosive eruptions, pyroclastic flow and lava spilling. However, according to scientists, Arenal Volcano remains active. Although the indigenous populations inhabiting Costa Rica before the Spanish arrival did not build architectural structures rivaling the Mayan pyramids of northern Central America, they did leave behind elaborately carved stone spheres whose meaning remains a mystery to this day. There are 235 registered stone spheres in Costa Rica, all of them equal in perfection, measuring up to two meters and as small as 20 centimeters. They were created over a 1,000-year time period that began around the year 400 A.D. and lasted until the colonization of Costa Rica by the Spanish. The majority were found in the South Pacific and constituted such an important element to these societies that their production survived nearly a millennium. The spheres were associated with pre-Columbian populations and regions where plazas, passing zones and open terrain were present. They constituted an art form that was meant to be seen, perhaps to differentiate the towns in which they were made from their neighbors. The spheres were often aligned with each other, forming lines, triangles or rectangles with an unknown meaning. These indigenous groups also became recognized for their metal and ceramic work, and Costa Rica’s South Pacific was, in fact, the principal locale for pre-Columbian objects. With a marine surface that is ten times bigger than the terrestrial and an immense biodiversity, Costa Rica is the perfect place for diving fanatics. The majority of these places belong to wildlife protected areas around the country, such as the famous Cocos Island National Park, which is also a World Heritage site. Costa Rica´s Pacific coast is considered by Rodale´s Scuba Magazine as one of the top five destinations in the world for advanced scuba diving. But the Caribbean coast has its own wonders too. For example, the Gandoca-Manzanillo Wildlife Refuge is unique because of the amazing species found there. In only five square kilometers of coral reef, scientists have discovered 600 species of mollusks, 10 percent of which are unique in the world. 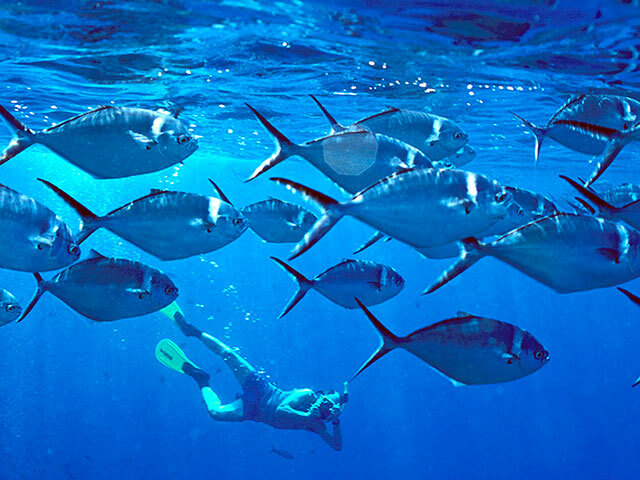 In general, the Costa Rican oceans shelter at least 6,777 species, representing 3.5 percent of known species in the planet and also making the country a must-visit destination for diving enthusiasts. Marine turtles have inhabited the Earth for over 100 million years, surviving extreme climatic changes. Costa Rica is home to some of the most important turtle nesting beaches in the world, where it is still possible to witness this old survival ritual. On the Pacific as well as the Atlantic coast, hundreds of female sea turtles representing five different species of the world´s seven species of these reptiles, arrive on Costa Rican beaches to carry out their tireless mission to guarantee their survival. 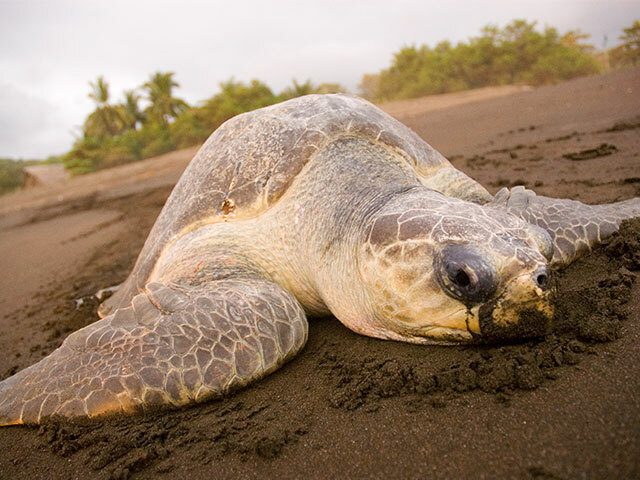 For example, Ostional Beach, on the Northern Pacific coast, is considered the main nesting site for the olive ridley turtle, which is famous for its large mass arrivals. The giant leatherback turtle cannot go unnoticed, even though it is in great danger of extinction due to man-made causes. It is not only the largest sea turtle on the planet, measuring up to 1.8 m and weighing up to 400 kg, but also the furthest traveling reptile. Their journey takes them from their feeding sites back to the beach where they hatched in order to lay their eggs. In some cases, these giant turtles travel between continents. Other sea turtles that can be seen in the country are the green, hawksbill and loggerhead. In 2009, the most important archeological site in Costa Rica, the Guayabo National Monument, located in the outskirts of Turrialba Volcano, was declared a World Engineering Heritage Site by the American Association of Civil Engineers (ASCE). 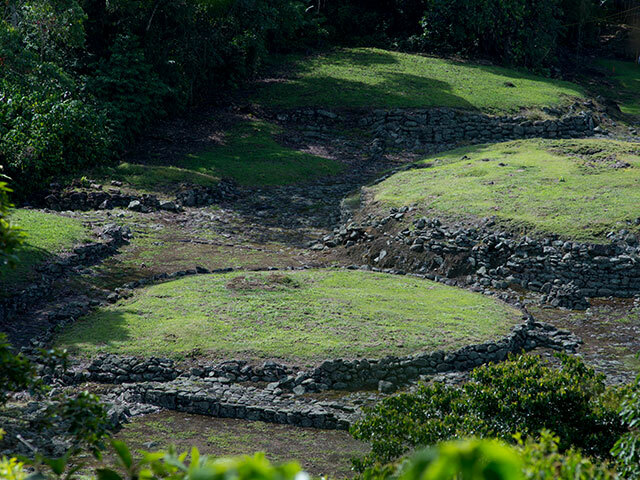 Guayabo is the third archaeological site in Latin America to receive this distinction after Machu Picchu and Tipon in Peru. One of the reasons is its over 700-year old aqueduct, still functional today, as is its “calzada”, a stone walkway used as a transit route and part of the drainage system. The calzada leads towards a ceremonial center, where it is possible to observe several mounds which at one time served as supports for the famous conical roofed straw and reed structures of South American influence. Stone was commonly used in Guayabo to build a system of sidewalks and walls that helped prevent erosion and landslides. There are also stone tombs decorated with pebbles, flagstones and engravings or petroglyphs. Guayabo was constructed between 300 B.C. and 1400 A.D. and was populated by indigenous groups of the Intermediate Cultural Area, which extended from Alajuela, in Costa Rica, all the way to Colombia, Venezuela and part of Ecuador. Despite the fact that Guayabo was no longer populated when the Spaniards arrived and the causes of its depopulation are still a mystery, the site was for centuries undoubtedly a highly developed cultural and political-religious center, whose importance was heightened precisely because of its rich resources and the presence of the Turrialba Volcano. Costa Rica offers highly acclaimed, holistic spas famed for organic treatments and products. There is no guarantee that the fountain of youth is here, but then again, one never knows. Born in Costa Rica in the 90s, the canopy tour is the closest anyone will come to feeling like a monkey travelling through the tree tops. It is also one of the best ways to explore the richness of the canopy, where the biggest amount of the forest´s biodiversity is found and to raise awareness about the rainforest\\’s fragile ecosystem. It consists of a series of suspended cables attached from tree to tree on which one glides along using a pulley that is secured to alpinism equipment (the harness). Cables vary in length (they can measure even 700 meters long!) and end in small wooden platforms built in the tops of trees, which are located up to 100 feet above the jungle floor. The impact to the forest is minimal. This explains why biologists were the first ones who, more than three decades ago, started using this technology for research. 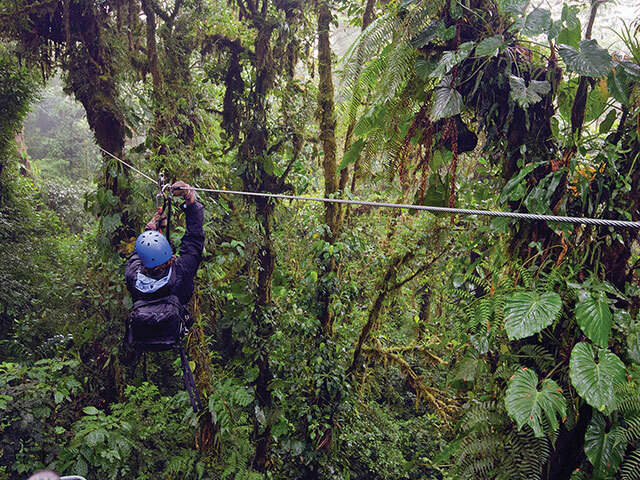 The canopy tour has been adapted to a great variety of environments and landscapes within the country, including mountains, canyons, rivers, waterfalls and cloud, dry and tropical forests. The tour has also been exported to other Latin. It seems like every surfer who visits the country agrees that Costa Rica is one of the best places in the world to surf; it’s no accident Costa Rica is the third most popular destination for this sport after Hawaii and Indonesia. The reasons are simple: beaches with excellent year-round waves, pleasant weather, warm water, friendly people and reasonable prices. In 2009, Billabong World Surfing Games took place in Costa Rica, with 35 countries participating. To host the games, Costa Rica beat out renowned surf destinations like Brazil and South Africa. Consider: Costa Rica has two great oceans within a 6-hour drive of each other. This makes it possible to surf the Pacific in the morning and the Atlantic in the afternoon. These warm waters are just what these whales are looking for when the winter time arrives. Northern humpbacks are normally seen from December to April and southern humpbacks from July to October. The spectacle is amazing, taking into account that they can measure up to 16 meters in length and weigh up to 40 tons. The name is due to a small hump in front of their dorsal fin that can be very noticeable when they double over to dive into the water. The elderly of the Nicoya Peninsula in Southern Guanacaste, many of whom are in their 90s, are among the most long-lived people in the world. This phenomenon was measured for the first time in a 2004 demographic study, which found that those in their 90s in this region have a 10 percent lower mortality rate than the rest of the country. With an area of more than 2,500 square miles and a population of just 132,000, over 5,000 of its inhabitants are over the age of 75. The study also found that Costa Rican males have a longer life expectancy on average than their counterparts the world over. This means that a Costa Rican man who reaches his 80th birthday will, on average, live 8.2 years longer than if he resided in Japan, the U.S. or Iceland. If he reaches 90, he will, on average, outlive his counterparts in those countries by 4.4 years. The phenomenon of longevity drew the attention of writer Dan Buettner, founder of Bluezones.com. His mission is to identify what he terms “blue zones,” or areas of greater longevity around the globe; not only areas where people live longer, but also where they seem to enjoy better health than those who live in surrounding areas. 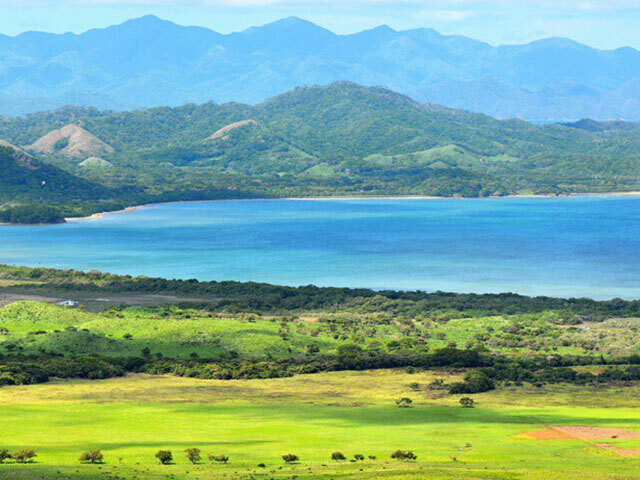 He and his team, with the support of the National Geographic Society and Allianz Life, corroborated in 2007 the accuracy of the data in Costa Rica, but also identified a blue zone in the Nicoya Peninsula where the residents likewise live longer on average than those in the rest of the country. Other blue zones internationally include Sardinia (Italy), Okinawa (Japan), and the valley of Loma Linda, California (USA). According to scientists, genetic factors play only a 25 percent role in determining how long we live. The rest is determined by our lifestyle and daily habits. One thing that means is that even though you don\\’t live in Nicoya, you can still apply some of the research findings to increase your longevity. Besides specific factors in the region such as water rich in calcium that strengthens bones and a diet rich in fruits and hominy (nixtamal) with their antioxidants, niacin, and amino acids, there are other secrets one can adopt which have to do with how these people approach life. Living in extended families, having faith and engaging in physical labor that keeps them in shape are three more pieces of the longevity puzzle of the Nicoyans, factors that also help them to live a life that has direction, meaning and connection to others. Such a lifestyle brings about happiness, which in turn raises endorphin levels and strengthens the immune system. Apparently the people of Nicoya are not only concerned with their own lives, but see themselves as connected to others and stay active and seek to learn new things throughout their life span. And so they get to add a new candle each year to the cake. Historically, the most active of all Costa Rica volcanoes, Irazu, is also the biggest neighbor of Costa Rica´s capital city. Located, in fact, 30 kilometers from San Jose, this colossal giant reaches 3,432 meters above sea level and thanks to its height, on a clear day, both the Pacific and the Atlantic oceans are visible from its peak. Irazu volcano has been a national park since 1955. 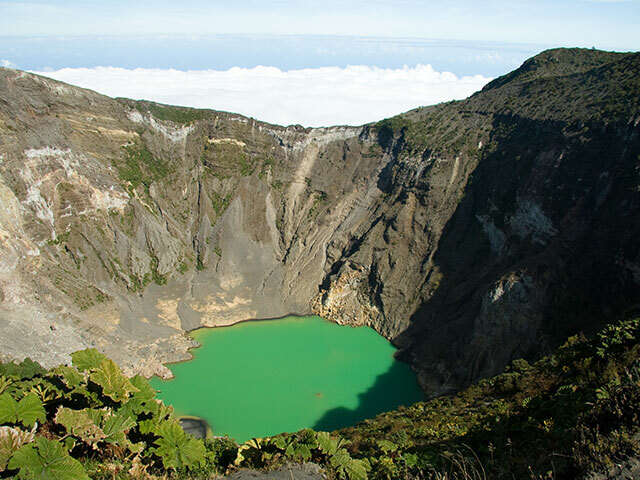 Its name comes from the indigenous word “Istaru,” meaning “mountain of tremors and fire.” Despite of being the volcano with highest altitude in the country, its summit can be reached easily by car, making this five crater volcano very accessible to all visitors. Situated in the main crater of the volcano, there is a stunning, sulfurous, turquoise-green lagoon measuring more than a kilometer in diameter and some 300 meters in depth. It has an average temperature of 35 degrees Celsius and reaches 70 degrees in areas closest to its fumaroles. The summit is crowned by an interesting Andean-like vegetation consisting of small shrubbery and its ample, semi-desert like landscape that in some way resembles the moon’s surface.